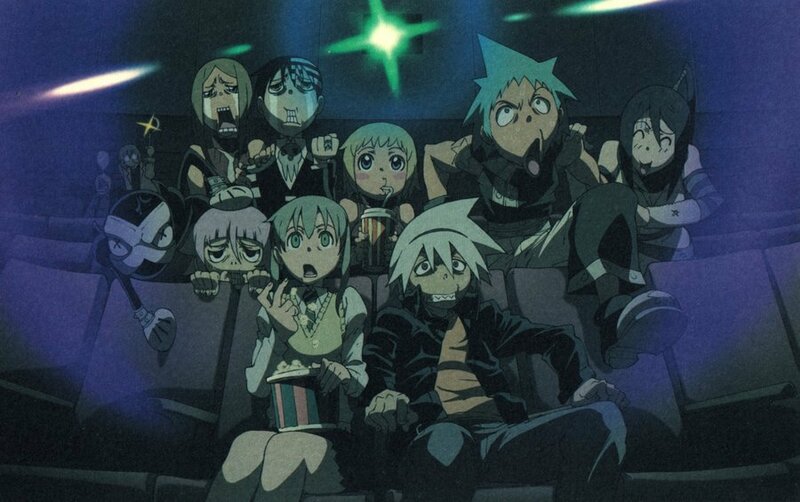 Soul Eater (Пожиратель душ). . HD Wallpaper and background images in the Soul Eater (Пожиратель душ) club tagged: maka soul eater. they are so stupid here! (laughs) really funny to the max!!! WHEN IS THIS??? WHERE COULD I FOUND IT!!! tha real creepy part here is smexy stein int background... WITHA A SCAPEL!!!! Wow isn't it funny how they're the only ones in the movie theater??!!?? BTW great pic!!!! i never thought soul would be scared i mean he is like....the not freak out type. soul is kinda the goth\lazy\hotandsexy\scary type. Don't toch the haaaaaat!!!! Boom. Ah soul I think you wached to much cartoons. Hahahaha!!! Classic Liz, most are scared in this picture. Guess it was a horror movie.